Return to Who is Luisa? “When I have completed everything, I will entrust my kingdom to my ministers so that as second apostles they will be Its heralds. Do you believe it is coincidental the visit of Fr. di Francia, who has shown so much interest in the publication of everything concerning My Will? No, no, I have arranged it; it is a providential act of the Supreme Will that wants him as first apostle and herald of the Divine Fiat. As founder of a work it is easier for him to approach bishops, priests and people, and also in his own institute, announce the Kingdom of my Will. For that reason I assist him so much and I give him special light, because to understand a Divine Will, Holy and Eternal, great graces and not a small light but a sun, are needed, as well as great disposition from the one to whom this office is conferred.” (Jesus to the Servant of God Luisa Piccarreta. Volume 20 – November 6, 1926). The teachings that our Lord gave to Luisa on the Divine Will gave a new characteristic to Father Annibale’s spirituality, which completely transformed his interior life. And so, we can truly say he was one of the first sons of the Divine Will and consequently one of the first apostles of the Divine Will. Father Annibale met Luisa around the year 1910. For seventeen years, their spiritual friendship grew ever stronger, as we will see, until the day of his birth into heaven on June 1, 1927, which is the day Pope John Paul II selected for his liturgical feast day. Many times he would go to Luisa’s house; as he was her extraordinary confessor. In his last years, the Archbishop of Trani appointed him director over everything referring to the publication of Luisa’s writings. He was named ecclesiastical censor for the Archdiocese of Trani-Barletta-Bisceglie as well. He was also the first to begin publishing Luisa’s writings, the first of which was “The Hours of The Passion of Our Lord Jesus Christ,” which she wrote around the year 1913 or 1914. 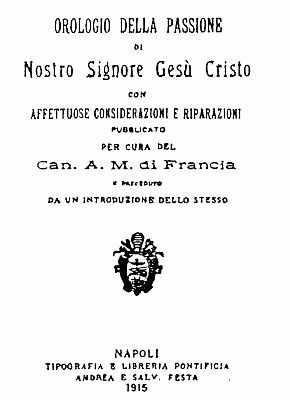 Saint Annibale made four editions of this book (1915, 1916, 1917 and 1921), all bearing the Nihil Obstat and Imprimatur . translated into Englesh as «The hours of the passion of our Lord Jesus Christ». Among the documents that we have regarding Saint Annibale, there are various letters written by him to Luisa during the last two years of his life (1925-1927). We have selected a few paragraphs to show how the Divine Will made its way in his soul. In all of his letters, Father Annibale clearly reflects how the Divine Will has come to be the center of his life, of his spirituality, and of his only reason for existence. Here are some paragraphs illustrating this. « In my current morning meditations- he writes- besides the Hours of the Passion of our Lord Jesus Christ, I am carefully reading and meditating on two or three chapters of your writings on the Divine Will, and the impressions I get are intimate and profound. I see a sublime and divine science in them, although I have not yet been able to penetrate them thoroughly, for my lack of intelligence. It is really necessary to make these writings known to the world now, and I believe they will do a great deal of good. This science of the Divine Will is lofty, and yet these writings dictated by heaven present the doctrine in all its purity and clearness. According to me, there is no human intelligence that could have conceived them. ». « I continue to read your writings: They are always sublime revelations, with illustrations worthy of the divine Creator, as for example, the comparison of the heartbeat to the one act of the divine Fiat ». When we say that the Divine Will changed his whole spirituality and his whole life, both interiorly as well as exteriorly, we aren’t saying this as our point of view. No. He himself says it in his own words. And the next paragraph makes it clear just how far the Divine Will wants to go in the souls where it wants to reign. « His Excellency, the Archbishop, has given me authority over you regarding your writings and their publication, in other words, to direct you and to see to the publication of your writings. His Excellency, said, “I believe it is the right thing to do.” These faculties cover everything you have written up to this point, and all that you write in the future. The Archbishop was pleased to put so much trust in me for this work- which is something that Jesus himself has disposed- that he named me Ecclesiastic Reviewer for all the publications of his three dioceses. And he even went so far as to get involved, by giving his authoritative Imprimatur after my Nihil Obstat. « Lady Obedience demands that you write absolutely everything that the Lord reveals to you, without omitting anything. It is the word of uncreated Wisdom, and just one word is worth more than the whole universe. So, it is not permissible for you to leave off even a single syllable. If you are not exact in this obedience, I will ask your archbishop for a greater authority ». « I want to let you know that yesterday, the First Friday of the month, dedicated to the Sacred Heart of Jesus, I presented Volume Three (which I have finished reviewing) to our Lord. Afterwards, I went into the sacristy and signed the Nihil Obstat with the authority given me by his Excellency, the Archbishop of Trani, when he appointed me ecclesiastic censor of his three dioceses. With this, authorization has been given to publish in the whole world these books dictated by our Lord on the Divine Will. Once I finish reviewing the rest of the volumes that I have not read, I will put my Nihil Obstat on them and will present them to his Excellency, the Archbishop, so that he can put his Imprimatur on each one of them as he promised, as well as on those you have which I have reviewed. This way, everything will be ready for the future. Who knows whom our Lord will make use of? «His Excellency, the Archbishop has already put his Imprimatur on seven more volumes of your writings. Meanwhile, I am finishing volume two, five and six. Truly the Lord has guided you with immense goodness and charity ». 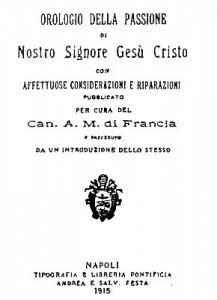 As we will see, it was Father Annibale’s intention to publish all the volumes that Luisa had written up to that time (nineteen); and to do so, he put the children of his own two congregations to work but long before he came to know the rest of her writings, almost immediately after meeting Luisa, he published one of her books, “The Hours of the Passion of our Lord Jesus Christ,” which we mentioned earlier. Four editions of this book were made, each edition being of a greater number than the previous one. Requests were received from every part of Italy and even from other countries. Some requests were for fifty copies, and some even for a hundred, such as the request that one of the best-known bookstores of the Vatican made, as St. Father Annibale writes. How did they find out about it? He answered; it is the good God who is working. Later, two more editions of this book were printed in Italian, two in German (of 25,000 copies per edition! ); and editions were being prepared in French, Portuguese, Spanish English and Polish as well. As St. Father Annibale came to know the rest of Luisa’s writings, penetrating deeply into this spirituality, he became aware of their capital importance and of the absolute necessity of making these volumes on the Divine Will known to the entire world. Then, he assumed the responsibility himself, of heading the work of publishing all of Luisa’s volumes. Although the task was gigantic, as he himself had said, with generosity and complete abandonment into the hands of providence, he began the undertaking. First he reviewed them in order to obtain the Nihil Obstat and the Imprimatur, as we have already seen, and then he began to actually publish them. From the following paragraphs of his, we can appreciate his immense interest, and the extremes to which Saint Annibale went. It is unnecessary to say that his intentions were truly impressive. « This task isn’t enormous only for all the reasons I have told you previously, but also for this: The consideration that we are dealing with 25,000 copies of the entire work, of the whole set of volumes, present and future, so it will cost millions of liras. Now, the rage of the devil couldn’t help but make itself felt. He had to stick his hoof in the works, and do everything in his power to keep these writings from being published and from doing all the good they will do. « I have entered into a moral and spiritual state in which it seems to me that I see and feel the diabolic work of the infernal enemy. Night and day they attack me, making me feel discouraged and oppressed. I feel profound abandonment and desolation in myself. In a word, I feel an interior state of anguish and pain unlike anything I have ever experienced before. It seems to me that what you wrote to m e about is happening. What I mean is that the demons were filled with rage to see me busy with the work of the publication of your writings. And since they can’t do anything to me externally, since I don’t walk along those paths, they work on my interior to beat me down and make my health fail. « I tell you in the strictest confidence, that to discourage me, the devil took the form of a person whom we know, to bring me some awful, terrible news that gave me such severe heart palpitations that they almost killed me. But afterwards, the deception was discovered. He had a very high esteem and appreciation for Luisa. He was very much aware of the “great work of the Divine Will” (as he used to call it) that God was doing in Luisa for the good of all humanity. Finally, the work that Saint Father Annibale had begun ended with this death. Still, as we read below, he left us another prophetic sign, which he would have liked to see fulfilled: “The Sons of the Divine Will”. But the plans of the Lord were different. Nevertheless, now he is surely enjoying its fulfillment from heaven. « To Canon Vital, one of my dearest priests, and to my young priests, I have been explaining what my idea is concerning the publication of this great work. Being very intelligent and possessing the right spirit, they could be my successors in this great work if the Lord should call me: and they would continue my work using the same methods and system I have been using ». But unfortunately, after his death, they did not continue what he had entrusted to them. So, one can clearly see that St. Father Annibale is like the initiator, the pioneer of the Divine Will, who was to prepare the way for the recognition of the volumes and therefore of all their contents, on the part of the ecclesiastical authority, with the granting of the Nihil Obstat and the Imprimatur. In other words, it was the recognition of all our Lord had communicated to Luisa, and had taught her to live to perfection: the Kingdom of the Divine Will on earth, as it is found in heaven. Our Lord’s most ardent desire is to give all his children the greatest gift that exists both in heaven and on earth. The gift of the Divine Will is that gift which makes it possible for the creature to return to the order, to its place, and to the purpose for which it was created by God.». In view of all this, we can say that the canonization of Fr. Annibale Maria Di Francia has more than a prophetic meaning. It is like the beginning of the glorious manifestation of the Kingdom of the Divine Will in a visible way, insofar as a mortal creature can perceive it, and in proportion to the disposition of the will of each one of us, to die completely to our human will, to live always and only by the Divine Will. We firmly hope that Luisa will also be glorified soon on earth, fully aware that the true glorification of Luisa will be that the Divine Will reign and dominate in our souls as on its royal throne.